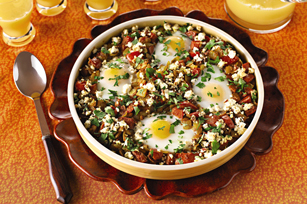 The feta cheese adds delicious tang to this easy-to-make brunch dish. Heat oil in large skillet on medium-high heat. Add next 3 ingredients; cook and stir 5 min. or until onions are lightly browned. Stir in tomatoes and seasonings; cook 5 min. or until tomatoes are softened, stirring frequently. Remove from heat. Stir in 1/4 cup feta and 2 Tbsp. fresh coriander. Spread onto bottom of 1.5-L casserole dish. Use back of spoon to make 4 (2-inch-wide) depressions in tomato mixture. Break egg into each depression. Top casserole with remaining feta. Bake 20 min. or until egg whites are completely set and yolks begin to thicken but do not become firm. Sprinkle with remaining fresh coriander. Substitute your favourite Kraft Shredded Cheddar Cheese for the feta. Serve with warm toasted naan bread.